If you’re reading something, even a one-sitting short story or article, you’re making a commitment. You’re making a lot more of a commitment because reading is in fact extremely interactive from a neurological point of view. Your brain lights up a lot. Whereas [listening to] music is more like something that happens to you, reading is something you do. Daniel Tammet‘s TED talk A Different Way of Knowing is a fascinating look at how humans perceive language and meaning. Perceptions are at the heart of how we acquire knowledge. Esthetic judgements rather than abstract reasoning guide and shape the process by which we all come to know what we know. Highly recommended: Daniel’s book, Born on a Blue Day . At the molecular level, early studies indicate that exercise stimulates one of the brain’s most powerful growth factors, BDNF. That stands for Brain Derived Neurotrophic Factor and it aids in the development of healthy tissue. BDNF exerts a fertilizer-like growth effect on certain neurons in the brain. The protein keeps existing neurons young and healthy, rendering them much more willing to connect with one another. It also encourages neurogenesis, the formation of new cells in the brain. The cells most sensitive to this are in the hippocampus, inside the very regions deeply involved in human cognition. Exercise increases the level of usable BDNF inside those cells. Imagine what it might be like to have perfect recall of every day of your life. 60 Minutes aired a fascinating story on five people who have Superior Autobiographical Memory–the ability to recall every day of their lives with frightening accuracy. The discovery of people with instant access to virtually every day of their lives could recast our whole understanding of how human memory works, and what is possible. And that has implications for all of us. MRI scans on five of the six participants revealed an abnormally large temporal lobe, (an area of the brain believed to help store new memories) and an abnormally large caudate nucleus–an area of the brain involved in learning and memory and in obsessive compulsive disorders–traits of which all five exhibit in varying degrees. Is it possible we all have memories of every day tucked away in our brains, but we just can’t retrieve them? Could understanding these remarkable people someday help with Alzheimer’s and other memory disorders? Tatiana and Krista are not just conjoined, but they are craniopagus, sharing a skull and also a bridge between each girl’s thalamus, a part of the brain that processes and relays sensory information to other parts of the brain. Or perhaps in this case, to both brains. There is evidence that they can see through each other’s eyes and perhaps share each other’s unspoken thoughts. Adding to the conundrum, of course, are their linked brains, and the mysterious hints of what passes between them. The family regularly sees evidence of it. The way their heads are joined, they have markedly different fields of view. One child will look at a toy or a cup. The other can reach across and grab it, even though her own eyes couldn’t possibly see its location. CBC’s Doc Zone recently aired a compelling documentary about the Hogan girls. Watch Twins Who Share a Brain. The Guadian published a fascinating memoir from Tom Lubbock, who describes living with a glioblastoma multiforme, an extremely rare brain cancer in his left temporal lobe–near the area of the brain responsible for speech and language. On the one hand, the fear of losing language is consuming me. And I can’t imagine how it will go. On the other, the impetus at the start is not to fear but, rather, to be taken up by the strangeness and wonder of it and examine all the new things it brings. Esquire Magazine’s November issue has a fantastic profile on Henry Molaison and his remarkable brain. Brain surgery, whatever the era, always requires at least two frightening qualities in its practitioners: the will to make forcible entry into another man’s skull, and the hubris to believe you can fix the problems inside. After a bicycle accident at age seven, Henry experiences seizures that increase in frequency and severity–into what the scientific community now call tonic-clonic seizures. He barely graduated high school–suffering ten or more seizures a day. In 1953, Henry visits Dr. William Beecher Scoville, who performs brain surgery when anticonvulsive drugs fail. Dr. Scoville removes the hippocampus, amygdala, and uncus from both of Henry’s brain hemispheres, calming his seizures at the expense of his memory. The feature article–a fascinating read–was written by Dr. Scoville’s grandson, Luke Dittrich. This slide of a cross-section of a human male brain, magnified 100 times, showed scores, maybe hundreds, of tiny brownish triangular bits of a toxic protein called tau, choking off cellular life in the brain. Lou Creekmur: 10-year NFL offensive lineman, Pro Football Hall of Famer. Wally Hilgenberg: 15-year NFL linebacker, one of the key members of the Vikings’ Purple People Eaters defense. Dr. McKee has studied 14 brains of former NFL players–13 of those, she diagnosed with chronic traumatic encephalopathy (CTE)–the same condition that affected Louis Creekmur and Wally Hilgenberg. While Louis Creekmur was demented when he died other players developed ALS and behavior problems from repeated head trauma. 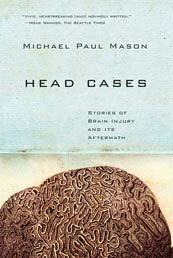 Further reading on what can happen to survivors of traumatic brain injury: Head Cases: Stories of Brain Injury and Its Aftermath by Michael Paul Mason. Who are we, other than our brains, really? Mason is a brain injury case manager who explores this question, profiling 12 brain injury survivors and their individual struggle to reconcile their former and present selves. The brain, the core of our very self, is so powerful, yet shockingly frail. The microscopic connections that make up thoughts, wishes, goals, desires, and memories, are so easily torn asunder, rent by a sudden fall, an accident, that takes them all away, altering the victim irrevocably. Shear injuries are seemingly the most insidious of brain injuries. Axons and neurons are damaged at the cellular level, breaking microscopic connections across the brain. Because there is no localized, obvious head wound or trauma, shear injuries often go undetected in hospital emergency rooms, leaving the survivor to learn the extent of their injury by countless indignities suffered discovering once effortless skills and abilities suddenly lost. As a brain injury case manager, Mason fights on behalf of survivors for proper treatment and services to help them to regain not only skills but also their identity and their dignity.